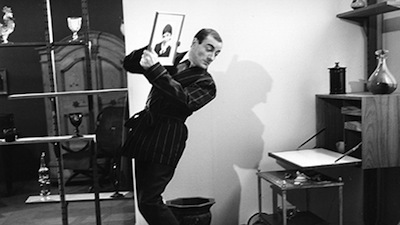 Pierre Étaix's 1966 (and 1971) film As Long as You're Healthy (also known as As Long as You've Got Your Health) is an anthology picture, featuring a quartet of lengthy skits showcasing the clown's penchant for visual gags and physical slapstick. On its original release in the mid-60s, the stories were threaded together by a unifying character--essentially, Pierre Étaix. In 1971, the director regained control of the movie, and he re-edited the feature to fit his original vision. One segment was cut, and another, his previously unfinished short subject "Insomnia," was added in its place. 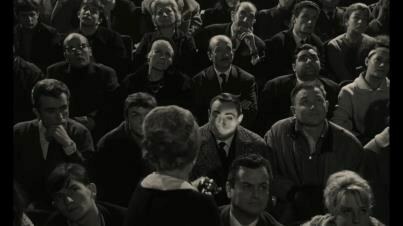 As Long as You're Healthy is presented as pure entertainment, framed only by the conceit that we, as the audience, are watching it in our own theater--not unlike what Jean Renoir would do with his "petite cinema." The tales have no connectors except for cutting back to the theatrical façade. Each section is distinct, with only stylistic overflows. "Insomnia" leads and is the most different, not leastwise because it's in color while the other 3/4 of Healthy is black-and-white. 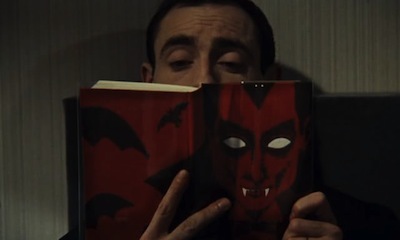 It shows Étaix in bed, reading a vampire book to fall asleep. 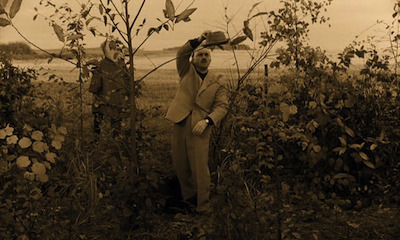 The movie goes in and out of his brain, showing the words he reads on the page coming to life as actual events, and features several excellent bits connecting Étaix's behavior in the real world to what is going on in his imagination. The second piece is titled "The Cinema," and it stars Étaix as a moviegoer trying to find good seats in a crowded theater before the action leaps from the auditorium and onto the screen for an extended stream-of-conscious riff on advertising. The way Étaix moves through the showroom and how the camera roams the audience, zooming in on other comic characters and showing how they interact with their fellow moviegoers and the movie itself, brought to mind old Looney Tunes that used a similar set-up. Only here the observational humor is more grounded, playing on the common irritations that cinephiles endure in a multiplex when catching a film with folks who are less invested than they are. Truth be told, the laughs I got watching "The Cinema" were kind of cathartic. From a possible cartoon influence to a more credible contemporary parallel, the title track, "As Long as You're Healthy," has shades of Tati's Playtime [review]. Étaix careens through Paris on an average day, making comedic hay out of many modern problems, like traffic jams, quack doctors, and overcrowded restaurants. The best sketch comes at the beginning, however. A punishing jackhammer rocks a neighborhood, disrupting lives with its noise and vibrations, all the way up to Étaix's apartment, where the helpless comedian is trying to keep all of his stuff from falling over and breaking. It's a wonderfully choreographed sequence. Every time Étaix moves one precious object, another crashes down in its place. Finally, As Long as You're Healthy ends with "We're No Longer in the Woods," a triptych of wilderness travelers crossing paths and tripping over one another. Étaix plays a hunter out for the day. The other participants are a farmer building his fence and a city couple looking to picnic. Through a series of elaborate incidents, as each tries to go about his or her business, each action sets off a chain reaction that affects the others. How the affected parties react to the intrusion sets off another chain, etc. As Long as You're Healthy is a perfect showcase for Étaix's humor. He and co-writer Jean-Claude Carrière are at their best when exploiting the tunnel vision of the average man. There is nothing mean-spirited in how they cause their characters to bump into one another, and yet all the jokes arise out of individual foibles, from folks too caught up in their own pursuits to consider that they share the planet with others just like them. It's surprising, then, that the most impressive skit is the the closing piece of "The Cinema," when Étaix leaves everyday occurrences behind and goes into the invented world of advertising, parodying the all-in-one, all-purpose products that must have been gaining popularity in 1966. The orchestration of these routines is marvelous, with each gag butting into the next, exploding and imploding in tandem. Étaix ends up the hapless victim of his own campaign, always doing something wrong, putting the product to use in ways that exposes its flaws, and then having to cover lest he also expose the gullibility of his friends. Presented alongside As Long as You're Healthy is the short film Feeling Good. This is actually the original portion of the main feature that Étaix cut when he reassembled the picture. Judging by the content, my guess is that it somehow connected the city stories of "Healthy" and "Cinema" by moving the star outdoors for "Woods." 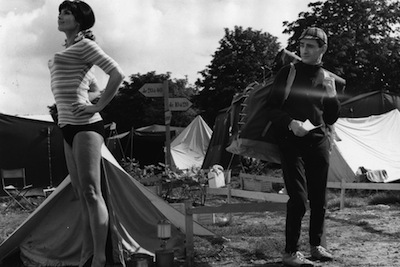 Feeling Good begins with a Buster Keaton-like morning routine where the camping Étaix stumbles and bumbles his way through making breakfast, before taking us to a nearby campground full of oddballs and nutcases. Étaix links each tent together by having his character walk through the camp and observing his fellow campers in action, before he finally finds his way out through the other side, tunneling like Bugs Bunny on his way to destinations unknown. 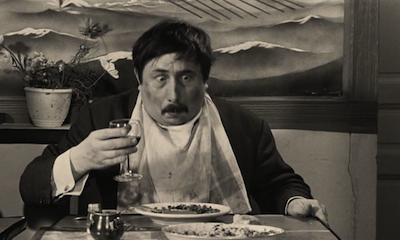 As Long as You're Healthy plays today, April 14, at 5pm, as part of the NW Film Center's Pierre Étaix retrospective. View the full schedule here.